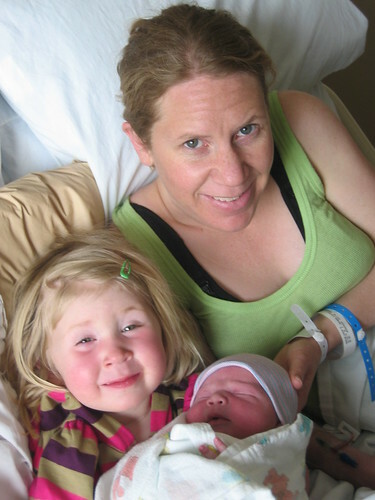 On April 18, Radha gave birth to Kieran Jacob Schnitzspahn. Radha spent about eight hours in natural labor and truly was amazing, pacing, breathing, taking time to watch Much Ado About Nothing, and, at 11:13 delivering a healthy boy. Kieran joins a long list of K names on both sides of the family (Karen, Kyffin, Kip, Kari, Kay, Kelly, Kristen). The name means “little dark one” in Celtic, but we simply liked the sound and feel of it. The Sanskrit name Kiran means “ray of light.” He is. Jake was his great-grandfather Marcum’s name and Jacob was also his great-grandfather Schnitzspahn’s middle name. So far he’s done what most guys do—eat and sleep. And he has had no problem with either discipline. Tanti Auguri!!! Kieran è bellissimo (e Isa, una carina e simpatica sorella grande)! Hey Radha and Doug–Congratulations! Wow, Kieran does look like Radha, sorry Doug. I’m sure that will change, too. What a crack up–Much Ado About Nothing–a funny movie. Cory and I just saw a funny one and really good too–A Good Year. Anyway, there might not be the energy for movies, but you never know. Sounds like labor went pretty well. Hope you are all happy and resting, and that house moving is moving along not too stressfully. Love the pictures. My best to you all. Hi to Isa! Congratulations! Eating and sleeping, the keys to healthy happy family. And thank god for good looking moms- they make the rest of us look good. Congratulations! What a cutie! What a beautiful family! Good job… enjoy these precious (and sleepless) moments… ! Congrats! Its good knowing you guys and seeing your lovely family grow. Awesome guys, you now have a family big enough to compete in the 4-man bobsled. Sweet 🙂 Congrats and three cheers to Kieran! What a beautiful family! I am very very happy for you and excited to meet the little man! How adorable! He looks just like you Radha! Can’t wait to meet the little guy. Happy to hear you’re doing well and I’m very impressed with the natural birth…two seconds into it, I’d be begging for drugs. Enjoy this time…but know that we miss you! Conhgratulations! Wish we were there to visit you guys. Congratulations!! How wonderful, truly a “big boy.” How small Radha got through such a production–yes, it’s amazing. A tribute to her resourcefulness and strength. He’s beautiful to look at. 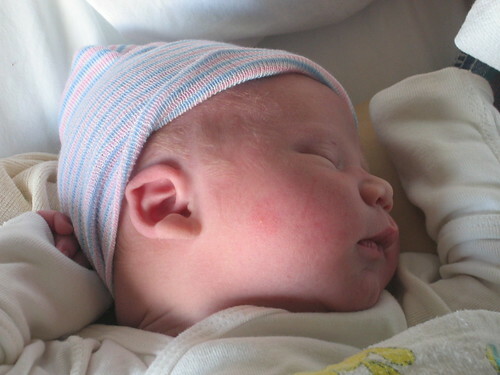 The name is lovely, too: Kieran Jacob Schnitzspahn, ready to eat up the world! (Sounds like he’s already started.) I particularly love the name Kieran –and know another Kieran whom I greatly liked, a companion of my older son’s in his adolescent years. Further thought on “Kieran”: it’s intriguing that the name means “ray of light” in Sanskrit and “little dark one” in Celtic. It seems almost certain to be the same word, the meaning of which through some sort of contextual use switched to the opposite. This is good, though: it means he combines fundamental opposites in himself and is thus more complete and prepared (or preparing) to take on the complexities of life. “Right now?” as Isa might say. Well, maybe later. Grampa Leon and I(Doug’s parents) are thrilled and can’t wait to meet Kieran! 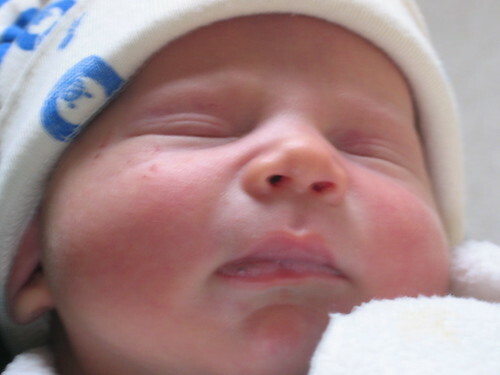 I agree with comments that he looks as beautiful as his lovely Mommy, but he sure does have Doug’s big apple cheeks. 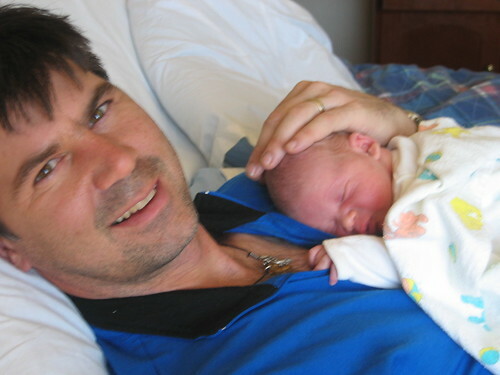 Doug was also a big, gorgeous baby and is still handsome (not saying this just because he’s my son!) And, of course, we think Isa is the prettiest little girl ever! We are so proud of them all! Wow! 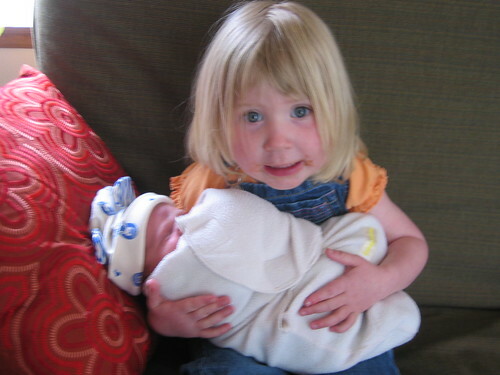 She came out sooo big and with a full head of hair, wearing a dress, and holding a baby-doll. Cute, er, “little” girl. A standing ovation to Radha for pushing out a such large two-year-old. Seriously folks, the world was already a better place because of the Marcum/Schnitzspahn marriage. It was like Doctors Without Borders and Greenpeace tying the knot. Or a Suicidal Tendencies/Indigo Girls superband formation. Whatever. Then the came trifecta, the triumvirate, the girl princess and future queen: Isa Weesa. She looks all innocent and sweet, but she’s got the brain of Foucault and the politics of Machiavelli. We know who tugs the Mom & Dad puppet strings, makes ’em dance on the throne. She whispers a few words in their ears, and her bidding is done. And, now comes the male heir, Boy King Kieran. I give up. The dynasty has been completed. Good looks, superior intellect, genetic mutations predisposed to using the other 90% of the brain: it’s sort of like the Boulder Kennedys, but without all the absurd tragedy. Queen Isa & King Kieran! I’m vying for some sort of advisorial position to the latest dynastic incarnation or at least a court jester or nanny gig. Congratulations to mom and dad. Mostly to mom who, I’m sure, performed 98.7% of the work until now. Remember that, Radha, and remind Doug hourly as he works towards some sort of labor equilibrium over the next 9-18 months. He owes you large. Expect “The Idiots Guide to Bicycling Appalachia for the Newborn” and “Dr. Spock’s Big Book of Scare a Bear With a Swinging Child in a Baby Sling (The Full Color Picture Version! )” in the mail any day now. Now that’s a beautiful family! Congratulations Rahda, Doug and Isa. Now, my fears have finally been relieved, the Schnitzspahn name will live on. Every since I borrowed Doug’s student card to get a discount on the bus, then memorized the spelling of the last name in case the bus driver said to himself-“hummm, the photo doesn’t look like this guy, but if he can spell this last name, its gotta be him”- did I realized the importantance of this last name. There’s an z followed by a s, brillant. There are 12, yes 12 letters in the last name, yet only 2 are vowels. When one of the four of you write the great American novel, Schnitzsphan is gonna to be one of best crossword puzzle answers ever… or think of Vanna White turning over that z then as s and audience gasping, then chuckling under their breath and wispering,”of course, Schnitzsphan”.We love you guys and miss you. Its too bad you live in Boulder, Siberia and us in the Bermuda triangle of Bozeman. One day we will meet again and I will proudly say hello Isa and Kieran Smith. Congratulations!What a beautiful baby. Enjoy the ride. It only gets better. Hooray for Kieran!! What a beauty. Brings back special memories. Enjoy. It was so great to see you all, and to meet little Kieran when he was just a few days old. He is an amazing baby! Welcome to the world Kiernan! Doug, so nice to hear from you. Congrats, congrats, congrats! come see us!